Truth, some believe, is stranger than fiction—even well-written pulp fiction featuring ridiculous man-sized outhouse leeches or a homicidal, incestuous hillbilly clan. Truth, some believe, is stranger than fiction—even well-written pulp fiction featuring ridiculous man-sized outhouse leeches or a homicidal, incestuous hillbilly clan. However, as a recent television series so cleverly proved, the search for truth can be a more fascinating journey. With this in mind, I’ve compiled these short stories chronicling the droll occurrences of my formative years in bucolic Pennsyltucky. These deliciously embarrassing experiences embody just a few of my attempts at developing a resistance to the subtle tickle of detachment I felt between myself and virtually every denizen of my simple rural community. I really loved this book. I picked it up with the intension of reading only one or two short stories before bed. However, I found myself unable to turn away from the world Pennsyltucky. The author gives us not only a wonderful collection of stories, but also a believable and genuinely vulnerable central character. 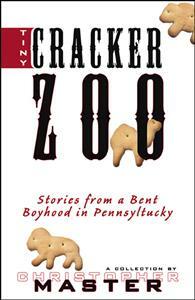 In Tiny Cracker Zoo, Chris Master digs into his childhood and comes up with gold. Here is a collection of engaging stories full of misery and wit, over-the-top language and wry observations of human nature. These stories are funny! The backwoods folks, the do-gooders, and the fearsome rednecks remind you that America still has what it takes to make a simple life completely idiotic. Yet, there are touches of great warmth, truthful scenes of family life and honor and respect given to those folks who suffer the duties of parenthood. And yes, you have to wonder about a kid who hands his pop a handkerchief full of poop. I can’t wait to read about Chris Master’s teenage years.